So I am starting up my “globability.org” work again and need a quick little project to regain the feeling of traction again. Some of you know the hard struggle that came down on The Global Ability Intitative, with “Russian” hackers trying to destroy our work by redirecting to… yah you know crapware n'stuff, as well as some SEO optimizing arseholes who had a stab at both my personal domain, as well as that of The Global Ability Initiative…. What a world eh? While I have never tried the LiveCode environment I figured I'll give it a try, as the promise of an easy to use cross platform application development framework that people are working on GPL'ing Kickstarter here is a great lure and being able to write once deploy to many platforms simultaneously, is something that I can't really stand for and why not try to chronicle my efforts as well so that others can learn. If you want to follow my progress and tag along (and eventually speed ahead… probably sooner rather than later) you can download the Livecode development environment at http://runrev.com/ in a 60 day free trial and create applications for Android, Linux, Apple IOS, Windows… though the trial is limited to one deployment OS at this time. Hope they'll change that. The User Reference manual is here. I also suggest you support the Kickstarter project they have going on if you have money or even the fact that you mention them is great stuff as well! Mind you that while I am using Day 1, 2, 3, 4 etc. does not imply full working days, but is merely an indication of what day I have worked of the 60 day trial period. I'll try to add some sort of time indication under every day. At the end of the experiment I will be putting this into a nicer and more consistent form and clean up comments and code to the extent I deem needed for using the POC for something educational. Spent a lot of time trying to get image location… however to no avail. But like I said I am not too familiar with the environment so all this is going to be very crude. put the result into field "xCoord"
put "finito" into field "xCoord"
put the result into field "xyCoordStart"
put the result into field "xyCoordEnd"
Now we add another element - the hole to where we wish our circle to be draggable to, and imaginative as we are we call this element holeWe lock the position (right click on image - select lock position)Now by using what our program already does we can determine if location is roughly within following x,x-y,y coordinates we can accept that we have pulled the circle to the hole and the answer is correct.So pull the circle around and find an acceptible zone and write down your findings.The coordinates I'm choosing are as follow: 60.90-40,70Now we need to look at our mouseUPwe need to use the coordinates we are posting into the textfield within an if structure to determine if we are in the correct position. put “placement for object circle is in the hole hooray” in answerText and then have different answerboxes on that stack card to keep functionality of code as simple and modular as possible. But before we get to our collision detection, let's see if we can't expand our location check into a loop like structure that runs while we have selected the ball, this will enable us to call our collision detection in real time and that we can see what is happening all the time while we are moving the circle. This see while functionality can be removed later, but is very handy for us while we are working as it lets us process to an extent, what is going on within the program using our eyes. put the result into field "xyCoordLive"
And Bingo - We have a continuous check on where our mouse cursor is. For now it is a boolean that is set to true when we grab the object, I have included some code that shows it's value on screen etc. put currentMouseLoc into field "currentXPos"
put currentMouseLoc into field "currentYPos"
I think we might as well try and create this on a card by itself or onto the main card so as to begin separating logical functions out of the button and creating a general purpose truthcheck to determine if selected buttons / items are correct. answer "You put the circle in the correct spot - Congratulations!!!" Today we're going to try and work a little smart. We'll have all the buttons figure out and tell us where on screen they are. This way we'll be able to re-use code even is screen is resized, stuff is moved about etc. In our hole script our hole should tell a location tracker variable where it is. In time code will be changed to have an accessor function in the hole object and a general movement tracker polling hole accessor or whatever object we want to track, for it's location on screen, thus removing activity from the general object behaviour, only to be triggered if asked politely :) thus, reducing the number of CPU cycles expended on our hole just to exist. For now we'll do an update of a global variable we get from the hole that is set and red when we click on the circle and release it after we move it about, in the future we'll have a location tracker controller poll for this information rather than polling the hole itself. --location (loc): The location of an object is specified as the X,Y coordinates of the center of the object in reference to the upper left-hand corner. --You change the location of an object by setting its location property in an x,y format. put cHoleButtonCoordinates into field "obj2FieldXPosition"
put cHoleButtonCoordinates into field "obj2FieldYPosition"
put cButtonCoordinates into field "obj1FieldXPosition"
put cButtonCoordinates into field "obj1FieldYPosition"
put "" into field "xyCoordEnd"
put cButtonCoordinates into field "currentXPos"
put cButtonCoordinates into field "currentYPos"
As you can see I've tried to structure the code towards something more universally usable all while fighting to get the darn values for the circle button…. Just found out I forgot to declare the variable I wanted to access… AAAAAAARGH!!! Anyway, going to hit the sack now - Happy I finally tracked this one down… sometimes I guess a good meal, the company of good friends and not least ones sweet wife is the cure when you're in a rut and feeling stuck…. So here's the plan. As this is a program aimed at testing dexterity and training dexterity as well as ability to use logic to distinguish between shapes etc. we'll begin with the big hole and making colission detection work within fixed parameters, after we have proven colission detection to work for placing the circle within bighole we can replace the fixed numbers with a variable called marginX and MarginY, these in term need to be accessible and changeable through a function. By introducing marginX and marginY we add both precision to our colission detection as well as the ability to move about our focus for colission detection, meaning we can reuse the routine for any object and focus on collission detection in different places. C would represent an exact match in the topmost corner, O would be a representation of right smack in the middle, while the others represent their own respective corner, but you can imagine the letters moving about to other boxes, only in reality the margin of precicion with which you can eventually set your collission detection is down to 1 pixel which I'd dare say is pretty good accuracy. We know the dimensions of the bigcircle image to be 78hx76w - You can figure out sizes of images by right clicking, choosing the property inspector and then select size and position easy peasy, you can probably also read this in your favorite drawing program before you import any images. We also figured out how to get the respective locations for our circle and our bighole objects, these locations are saved in two arrays for ease of access and understandability. At a later time we could change these into general location indication variables that can be reused in a location tracking structure that can then be used for tracking all objects on screen. But for now we'll do it the non general way so that you get an idea of what is going on. Size of circle 32hx32w (it was originally sized according to the size of a mouse cursor as it was supposed to be used in a sneaky little java manouver, but I never finished the java program, nor the HTML stuff as I got severely sidetracked by some nice crackers who almost brought my work on my persomnal page as well as the work on The Global Ability Initiative to a stand still…. anyhow back to colission detection. We want to claim a success if we manage to place the circle within the bighole so let us do a do a location check plus see if correct shape is selected. In setTruth() a variable called truthCheck is set to 1 - The use of numerical variables enables us to distingush between the precise object that is selected rather that just checking if something is selected, by knowing what object is selected we also know that if we (when we extend the program) put the square on the circle there is no match and thus the trainee has not placed the object correctly. Objects in LiveCode are defined positionwise by topmost,leftmost coordinates so we want to check the coordinates of the circle first against the topmost leftmost coordinates of bighole. We do this by comparing the values held within the arrays against each other. We do however also need to make sure that the circle is within the rightmost side of the hole, so as a minimum the rightmost part of the circle needs to be within bighole. We want the topmost part of bighole being equal to or lower than topmost part of circle and lowest part lower than circle. At a later stage we'll add the xMargin and yMargin we talked about so that we can make our colission detection more variable. Will probably do no coding today, have written to people within my company suggesting them to pledge, made a post on our intranet about livecode and the dignitaries that have pledged and will be making a couple of postings on a couple of forums I frequent from time to time. But as we are trying to approach this in an object oriented way - which of the above sound like more of the same ? I'd say that the following four could easily be put into the one and the same type of variable and use the same globally callable routine to be updated, in reality the terms would more correctly be used as parameters for the function in order for them to be placed within the correct datastructures. For instance the rightAnswers variable is a number from 0 to infinity, I'm hoping the LiveCode environment as mentioned elsewhere on the web truly will be taking care of this as it will be the premise for the structure I would like to create. The same goes for the other values mentioned. They are all numbers but we give them different meaning in different context, but they are merely data. So I'd like to introduce something called metaExplanation and uniqueIdentifier. The latter might be irrelevant as it is not unthinkable LiveCode already has a way of doing this, but for us puny humans to make heads or tails of what's going on let us keep it at least for now. Imagine a data structure consisting of objects of different kind, we will begin with our scorecard variables but it is not unthinkable we can add to the values herein or create similar structures for similar purposes. So what we need are functions to add said objects to specific slots in our datastructure and we need functions to manipulate the objects as well. But let us define a rough datastructure and then proceed to create the functions to create the objects and then the functions to manipulate values of said objects. The metaExplanation object is a description holding valuable information about what type of objects are stored within the particular slot of our datastructure. It holds a description of variables within said object, accessor methods and purpose of the related object. The reason for not containing this information within the object itself, is that in many cases, for computational purposes this is redundant information and would potentiall increase the size of our objects considerably. For future reference it should be possible to read this data out of the objects automatically, but for now the values will be added manually once we get that far. And that we then created a metaExplanationDataObject holding all the different metaExplanations numbering them from 1 to infinity for identification purposes. That way we would know exactly (in human readable form) what type of object we were dealing with etc. This might seem overkill but I believe being able to see things in human readable form, while working on a project is of great benefit for our understanding, even though we might remove such functionality from our finished product. We will need getters and setters for the values of each variable in our datastructure object. wrongAnswers, rightAnswers totalPoints can all be affected by our addNumber variable, addNumber can be affected from the outside individually as well, this way we can reuse the addNumber variable for multiple purposes whenever we need to add an integer to something. We shall be concentrating on the integers in this project I have merely added totalPercentage as an indicator that you might need a percentage at some point, could for instance be Health, or ownership or something similar you'd like to type out in percentages. addNumber - we will deal with by itself. startTime/endTime - are also something we'll look at later perhaps creating a time object that can hold all the information we desire. Let's look at creating some functions like addNumber and one to set both wrongAnswers, rightAnswers as well as totalPoints, leaving totalPercentage for a later time. Here's the preliminary code for scorecard - I have not tested the code yet, one way to test would be creating a button to add a specific value and another to add values based on something you put into a text input box, notice our functions now take parameters, that means we can pass for instance identification numbers and such to our functions thus determining different behaviour dependent upon what values we pass to them, pretty neat eh ? --the format for the object timeToSolve is "Puzzlename", ""Years", "Months", "Weeks", "Days", "Hours", "Minutes", "Seconds"
– * Notice datastructure not yet created - and the use of objects is wrong, should be variables as we are creating a dataobkject to hold information about objects in our program not an object to hold objects - And as LiveCode is not AFAIK truly object oriented it will be a datastructure rather than an object containing different variables. I estimate having only used minutes to actually playing around with the coding environment. Anyway here are some further thoughts on getting a value from one card to another beginning with transferring information from a button script to a card function. put  the result into field "numbertoadd"
call it from another ??? put  totalCorrect into field "numbertoadd"
So now we have discovered the premise for the structure needed in order to make a counter that counts up, say points, number of correct answers etc. what we need now is to see if we can wrench this functionality into cards below. But before that let us create a working counter of correct answers, we will wait with the incorrect ones till we have more holes to choose from, but a tally counting the number of times we place the circle in the hole is also a worthwhile pursuit. But first a few timer functions that will be coming in handy at a later stage. put the result into field "calcfield"
put the result into field "calcfield2"
put the result into field "calcfield3"
This is the counter code in the main stack - It consists of a so called switch statement, based on the parameter it is fed “answersIdentifier” it will perform a number of different operations by adding a number to our counter objects. Notice in particular the points part of the function. put "Sorry, there is no known Identifier, can't make selection of course." into line 1 of field "errormessages"
By using different values for “answersIdentifier” in each test button we can prove that our function does something different depending on the value we set in the button script. Our proof lies in the visual representation of the calculations that goes into the text fields. put the result into  field "wrongoutput"
put the result into field "rightoutput"
put the result into field "pointsoutput"
put "" into field "errormessages"
By creating a button using a wrong “answersIdentifier” we force the switch to give it's default response… just to clear the error dialog box we add the wait and then update the text field with ”“ i.e. nothing. I can do colission detection, I can calculate correct and wrong answers, I can count points, I can move buttons and images around, I can do timing. Basically I think have everything I need in order to proceed to the next phase which is gluing together the elements I created creating a trainer for dexterity and logic. Acknowledged it is not a big application, but I am amazed that I in the course of a couple of weeks with no prior knowledge and sparse time on my hands have gotten this far. I truly hope that RunRev will pull off their Kickstarter which at the time of writing stands at 1,107 backers having pledged £149,686 of the £350,000 goal with 7 days to go. If you have an interest in programming please support the Kickstarter to Open Source the LiveCode Environment under a GLP3 license. After spending time tending to loved ones, and resting after quite an ordeal, I have managed to do a minor thing LiveCode related - I started a Facebook advertisement campaign, :) As in real ADVERTISEMENTS. Code in Linux, Mac or Windows, write once. Deploy to iOS, Android, Linux, Macintosh, Windows, profit ??? No FREE if you want it to be!!! This is what Iactually ended up with, due to space, punctuation restriction, a 10 US$ daily budget, 0,41 per click, running from today to 27'th. Deploy to iOS, Android, Linux, Macintosh, Windows. Expensive? FREE if you want it to be! Furthermore I have enable grabbable qualities and set graphical quality in the property inspector to notScrXor so as to allow the objects to be shown transparently over the holes without the background - (transparent png) - probable have to look closer at graphical qualities but it is working so for now it'll be fine. I will now proceed to seing if I can get each to respont to their own hole using the common collission detection routing created. In time it is suggested to completely remove the colission detection from the objects, generalize them even more and putting them into a library loaded by the main stack, same with oter functionality developed, but as it is a POC this how it will be done for now. I'll be adding the code for the other objects ASAP. put object1Coordinates into field "obj1FieldXPosition"
put object1Coordinates into field "obj1FieldYPosition"
put object2Coordinates into field "obj2FieldXPosition"
put object2Coordinates into field "obj2FieldYPosition"
So how to make the application interact with for instance payment modules etc. well you won't believe how simple it is to launch your system browser. In the GUI there is a button called Support Us I wanted this button to lead to a page where you can both support financially as well as contact me, this could be to any other page you can imagine would be interesting for your users to interact with. And when I say simple… this is it! What the above piece of code does is open up the system browser at your desired url - Doesn't get much easier than that now does it ? And then instead of opening a browser LiveCode would attempt to show the text from the URL in the text field. And text is the key - if you ask LiveCode to fetch a txt file that is what you get. You could use this for creating ticker information etc. just to give an example of what you could use such functionality for. I will probably be playing with that as it makes it possible to show more dynamically updated material in your application. As you can see we need to keep track of what is happening to the individual symbols so we need to create some sort of tracking container. We could also keep track of how often each object is grabbed etc. as this will give an indication of ability to focus on an individual object etc. but for now let us just track time from start and till the object reaches the correct destination. For this we'll use the timing routines created earlier, only now we will use them to populate our time tracking containers. --to test we need to put circleTimeReport into "calcfield1"
put circleTimeReport into field "calcfield"
put "you already got the time dope" into field "calcfield"
put circleTimeReport into field "checkfield"
put ""  into field "checkfield"
Again you can se I use existing fields and have added another just to visually check what is going on - you could probably just send these events to a message window, but for now we're keeping it on screen. Later we can add a counter counting up on every mouse click so we can see how often the player has clicked, we can get an idea of ability to focus on the task at hand as well as ability for ongoing movements etc. if we do this. The values in the circleTimeReport can now be added to our overall usage report - The next test is to expand the timing to encompass all the objects. --put "you already got the time dope" into field "calcfield"
put circleTimeReport into field "calcfield2"
put circleTimeReport into field "calcfield3"
This will basically be a if on top of "wrong image name"
put "+1" into wrong answers counter and put text "Please move the " +NAME_OF_OBJECT_LAST_DRAGGED" into the hole with a similar shape"
Planned to be doing some coding tonight. But spent more time on the Kickstarter trying to come up with ways to promote. Put timing on one more button and played around with a very nifty feature that we will be using for our application - Fading buttons out of existence :) - Will need to look at how to set them unclickable and clickable - the fading bit is pretty straight forward. -- after we fade it out. We do it right after placing our timing object (TODO) in the report list (we have a code remark in the object already telling us we need to be doing this). Anyway this is the code you need to fade the button out placed right after the remark with some ekstra remarks about what we are doing. -- Here circleTimeReport needs to be placed in a list that can be used for our report. Basically what we do is that we move the circle to a predefined location, since we had our x,y coordinates typed out while we drag our objects around it is relatively easy to find the coordinates. Another way would be to do an ordered or random placement of objects upon reset, but for now we'll stay with a fixed setup. Once we have moved the circle to where we want it to be when we begin our session we fade it in - and that is what happens in the code snippet below. To make it nice it would be possible to do a general script that faded in all the objects according to a list and used the same function for doing all of them, the function would look roughly as below, only you'd exchange the coordinates with variables that you could feed and the name would be exchanged with a variable as well… I should do that in the final version but here is how the code looks for a single button “reset” to starting position and state. We will be adding functionality to make the button not clickable so as to avoid the button remaining active after being faded out. And then the initialization will make it clickable again. I imagine we'll do a setLoc function and a fadeInOut function, the first function will enable us to set the location of an object of a type to a specified x,y and the latter will enable us to do graphic manipulation on a specified object of a specified type, maybe even according to different levels of fade. put "I can be clicked" into field "errormessages"
Okay so that works - Can we now do the same for the control objects and will we see any adverse graphical effects. Indeed - simply exchanging the button with image and naturally the control name to circle instead of test_b we achieve exactly the result we want. We can now proceed to create a function enabling us to enable or disable specific control types. And build the function so as to allow us to disable any object given the correct variables. But I think it is time to catch some shut eye… total time played around today coding and figuring things out… an hour and a half or so - Remember, for a seasoned user this would be trivial, I do not know the syntax nor the environment so I am pretty happy about the time spent. I believe a trained coder could probably have created the application in a just few hours from concept to finished POC. So I tried to compile just for fun today and running on Linux without a hitch… going to test on a windows and possibly a Mac later. Created the code for the Exit button - If more than one stack is open I gather you'd need to heed that and code accordingly. But to exit stack this is the code you need - REMEMBER TO SAVE BEFORE YOU TRY IT!!!! answer question "Are you sure you want to exit" with "Yes" or "No"
Less than 10 minutes used for coding today includes googling for info :) - Hard to concentrate today, big party upstairs neighbours, so did not get any good sleep…. And replaced the code in Exit with what you see above instead of the close “stackname” - I do not know enough about the environment to explain why quit works and close does not but for now that's the way it's going to be. Today I've been looking at our report - What we needed for this POC is to be able to write a text report. At some later time we might be looking at databases etc. but for now we'll concentrate on writing a report to a file. This is a very good exercise as we by writing the report to a file can get a better overview of the data we are trying to put into a report and we'll be able to ponder upon exactly how we should format the data in order to generate an easy to enterprit view of the data we collect as listing them in a good manner is as important as gathering them for the understanding of a users abilities for his her physicians or th eusers own understanding depending on how you present it. So in our generate report button we need to declare our time report variables - As our primary object of interest is our circle let us begin by creating report entires concerning the circle. However there is something to keep in mind, we do not have an interest in overwriting data so we will be appending to the file instead every time we press generate report. write  circleTimeReport & return to file "///home/ep/data/globabilityorg/livecodeprograms/report_symbol_tracker.txt"
This directory needs for the final application to be changed to a data directory on the system where the application is to be run, but for now we'll keep a hardcoded path and filename. Notice that the file is being opened and closed - This is quite important as data is written upon file being closed. If you have loads of data it might be better to collect in memory and then write once your buffer is full so at to avoid constant read / write operations to your disk etc. The following displays how I progressed in choosing the form of my report to appear to the reader. As you can see the final look of the report file will be something like this, yes I know the time looks weird, but this is due to it being the clock in milliseconds unix time, so some transformation might be needed to get the data even more human readable. You will notice some things hard coded into the code below - The idea is that in the future such a line can be changed further so that object name (here Circle) becomes a variable changing with whatever object chosen and the same with the different things we are choosing to write to our file. But for now we'll stick with the hard coded info. You can play with spaces and separators to find your own ideal view, however later we will be putting this data into some XML like structure using human readable tags that could then be used as unique column names is SQL databases etc. write  "Object: Circle - " & "Start time: " & circleTimeReport & " - End time: " & circleTimeReport & " - Total time used: " & circleTimeReport & return to file "///home/ep/data/globabilityorg/livecodeprograms/report_symbol_tracker.txt"
This is done by putting 0 into each of the counters. By doing this we should be able to write multiple attempts with differing start and stop times as well as calculated time used into our report. While strictly not needed purging the circleTimeReport feels more correct. Particularly as the plan is to take the circleTimeReport variable and transform it into a general variable callable by all our “objects” and then establish a more formal structure in memory to hold our timekeeping before writing it to the report. This above will be done in our generate report button script. In addition after our fade out we insert some code to be able to restart timing our object, we need to remember that at this point no report is generated, this means if we reset our start time is lost forever. All his logic also needs to be moved out of the buttons and they should only call a buttonhandler script and identify themselves this to better adhere to the MVC pattern (Model View Controller) by implementing a MVC pattern changes in logic will be easier to implement and each change can have minimum effect on already established parts. That is done in the circle button script for now as the current variable to keep track of if timing is started or not is a local boolean true or false setting. Not too long used today… minutes really, lot's of distractions today after a long day at work… Would be nice to be able to dedicate my time to this… So if you have some cash spare, feel free to make a donation to allow me and others to work towards the creation of free software for the sick or disabled full time…. Anyway - think next step should be thinking about putting a counter into the timereport this would be the number of times the circle has been placed correctly and should be multiplied upon correct placement. This number will be a global called circlePassCounter, we shall when logic functions build a counter structure that can hold multiple counters as explained earlier, and then add counters for other objects / purposes as well. Time for coding none - Time used to ponder upon datastructures for further progress a couple of hours. While not complete the below text holds a more structured view on creating a general datastructure holding the information of for example circleTimeReport as well as the proposed circlePassCounter. The scorecard would probably be the perfect holding place for all this information about our objects. But as we are actually working on generating a report based on those numbers, why not continue to define a data structure there that better enables us to add information on the different objects that can be move about on the screen and that we find of value for the training session. We can then when we are satisfied with the general structure move it to the scorecard, then create a data structure that can encompass multiple structures for different users etc. We already have some information for our report in place but let's make our report a little more complete. For now we will hardcode a metadescription into the structure, but in time we will dynamically be creating the datastructure including the metadescription. The metaDescription can be used for database purposes describing the values we would like to put into one or more tables - I will not go into separating data into 3 normal form here (an SQL related term), but when you design your arrays you should do yourself a favor an try to create groupings that logically make sense as well as optimizing them datawise. Here a description of the fields in the progressReport array. [metaDescription] - Array holding variables containing dynamically changeable information on objects that can be moved about on screen. [usedTime] - For each pass there is a total of usedTime that is calculated the moment the shape is placed correctly, we use this time in our report a database would not need this information as it is a value that can be calculated and as it is a simple calculation not requiring massive computing power there is no need to save this variable. But for our txt report it will come in handy to store it in our array. [passNumber] - passNumber is simply a counter that keeps track of what pass a specific timing event is for, these should all be tallied together as they are also useable elsewhere and not just as an identification of how a specific pass has been carried out. [sessionsNumber] - sessionNumber is the number of the last session i.e. sessionsCounter + 1, this number “sessionsCounter” you can extract from data in the answersCountReport where sessionsCounter is stored. [userIdentifier] - userIdentifier has to be a non person identifiable identifier that can then in a doctors database be related to a specific patient. Why non person identifiable ? Simple - To protect privacy - The application might be deployed in an environment where it sends information over the internet so to protect the user we need a non person identifiable identifier as a placeholder so that the information regarding training sessions potentially done at home will not be misused. Another bite of data that might be interesting to put in a report for a doctor will be numbers of correct and wrong answers for a particular patient/player. [metaDescription] - Array holding variables containing some dynamically changeable information on a users interaction with the application as well as information not intended to be dynamically chaged per session. Been working from yesterday morning till early morning today - After a few hrs. of sleep been trying to finish up the working week. Evening now and would like to be coding but honestly doubt I'll be able to do any sensible work tonight other that preparing a livedistro and see if I can put a version of livecode onto the LiveDisk and with the current activision can keep coding or I need to have a new code or something. Great you are aiming at GLP'ing this platform, all software should be open sourced and free of patents only if this is the case we will see another golden age of computing as I remembered with the good old ZX-81 and the Spectrum where creating programs was just something you did for fun and everyone did it. I applaud your initiative - I've downloaded a trial from your site and will give it a spin creating a free app to help stroke victims and if it works I'll look at creating a few more using this platform. Also you should consider already now to allow people creating apps for all platforms in your 60 day trial if you are serious about going the open source way. Perhaps even skipping the whole 60 day limitation altogether already now if you are truly serious about this. I really hope you will reach your goal and will be trying to promote it if I'm happy about usability and end result. Here's a thought if it has not already been mentioned - Why not make the complete commercial packages available, as a revenue sharing deal, in addition to the standard license set up you have right now. imagine you getting 1% of the earnings from apps created if they become a hit. Then people can if they have an overnight success and they wish to “buy” you out invest in the regular licenses after earning a certain amount of money - perhaps roughly what the tools would have cost them plus a little extra to you guys for being nice enough to offer the platform or people might by staying in the revenue sharing deal get perpetual updates and other perks that others might not have access to. That way you could open up your entire platform for thousands of developers immediately who do not have the ability to pony up the cash up front and you might actually gain additional traction from such a move building an even bigger community right here and now. I would also recommend considering free rides for charitable software developers making their products made with LiveCode freely available at no cost to the general public… “DISCLAIMER” yes I do fall into the latter category myself and am right now running a little LiveCode tryout to see if I can create a minute application that can be used in connection with stroke victim rehabilitation and if it works I am quite certain more will follow. If there are any avid users here already I have multiple of ideas for FOSS apps that need to be made and no money or time myself but would welcome inquiries into an opportunity to help us out. I'm doing my little tryout at http://einarpetersen.com/doku.php… - it is crude, will take eons of time compared to the demonstrations you have seen here, but the intent is fair and I hope I in this way can help create some interest for the Kickstarter as well… I will try to tweet a little on my sina.weibo profile about this kickstarter and my pledge, as well as I have already done on my other social networking platforms. Once again - What a great initiative and wishing you guys the best of luck with the Kickstarter. @Sean O'Connor I agree with the comment below that the campaign is rather invisible to the world and that is actually too bad, because it is quite a worthy cause to see an environment like this being GPL3'ed. I did write the FSF about the Kickstarter attempts and I have tried to blog on sina weibo (chinese twitter/facebook social network) as well as on my other social platforms G+ / Facebook - As well as running a dev test on my own site, that will be available through The Global Ability Initiative as soon as functionality is a little higher. @All I suggest everyone interested in seeing this Kickstarter succeed, get working hard on spreading the news and if you at all can go that extra mile when you pledge. I think the environment is pretty interesting, at day 5 of my LiveCode Experiment where I've basically only fiddled around a from minutes to a few hours per day. I have been able to, without knowing the development environment, nor the syntax beforehand and more or less without reading the manual… to move buttons about on screen, track their locations and determine if they are in the right place and making simple collision detection based on coordinates. Yeah I know it is crude code but like I said I'm just playing around and truly hope sound will be as easy as well as I have applications in need of good playback capability and have had difficulty in clean playback using HTML5 because of soundbite size and the way HTML5 seems to handle sound… If this is successful and I can do a cross platform compilation test and see that this is also okay then The Global Ability Initiative will be releasing a couple of further applications based on LiveCode as gratis FOSS, so as you can expect I really excited to see how well the experiment will pan out. I strongly believe that if the above is in place I have found an environment in which to develop future applications that need to be cross platform. @RunRev - Really looking forward to further project updates! Perhaps RunRev could provide a list of media coverage so that those of us posting on our social media platforms can push this material as well to increase visibility and notability of your project and also know what media we do not need to push to write about the Kickstarter etc. Yes the promotion seems to be low key and a project like this needs a lot of traction to truly get going, the more RunRev shouts out the better are their chances of reaching their milestone which is still some way off. This is why I am asking about press coverage as it is vitally important to get good coverage as soon as possible. @RunRev what is happening with that list of outlets mentioned that are already talking about the LiveCode Kickstarter - publishing the list with links to press also helps you get better ranking etc. and it give us backers a possibility to link to material backing our enthusiasm for the environment. A continually updated list would be appreciated and is strongly recommended, also do an app marathon this weekend, invite people to participate and see what amazing stuff could be created in the course of 48 hrs…, and if you do not have it already I strongly suggest putting resources on a massive press push an app marathon could be what sparked the interest of the tech press. You're almost a third of the way now, keep fighting the good fight! Åbenbart så er de i gang med en Kickstarter der går ud på at smide softwaren ud som GPL3 hvis deres Kickstarter er successfuld. Jeg kendte ikke LiveCode platformen, men kunne ikke efter at have set deres promo lade være med at downloade deres 60 dages demo til Linux. Det der tiltaler mig ved LiveCode Kickstarteren er at de har et udviklingsværktøj som du kan lave cross platform kompilering til og som de vil gøre tilgængelig under GPL3. Jeg kunne derfor ikke lade være med at tegne mig som pledger af principielle årsager - Synes det er enormt fantastisk at se udviklingsværktøjer som dette blive released som GPL3. Det synes Steve Wozniak og Cory Doctorow åbenbart også og de har også tegnet sig for hver deres pledge og når “respektable” folksom disse tegner sig som pledgers så er projektet nok heller ikke helt ved siden af. Jeg kunne godt tænke mig at høre - Er der andre her som af principielle årsager kunne finde på at pledge til et sådant projekt eller er det helt hen i vejret at tænke således efter jeres mening ? I came across a really exciting Kickstarter the other day and it seems I am not alone in being intrigued. I've been playing around with the environment and suggest that if you are a programmer hobbyist or seasoned that you test the environment you will find links to RunRev's homepage from their Kickstarter campaign and there you can get your hands on a 60 day trial, and hopefully if the Kickstarter is successful a GPL3 licensed community edition with the full capabilities. If you suddenly want to go commercial and hide what you program i you can purchase an enterprise edition. You can find my beginning dabblings with LiveCode here einarpetersen.com/doku.php?id=livecodeexperiment - eventually I'll make a proper tutorial if I succeed. I'm making a simple app to train dexterity and test logical abilities for stroke victims that will report back to doctors etc. so they can follow their patients progress, it'll be free and open source off course. Why am I writing a post about LiveCode here - Well I have to admit I have a vested interest in seeing the Kickstarter succeed, after playing around I decided to become a backer of this project by making a pledge not just because I feel it is an interesting development environment but also as I am an avid proponent of Open Source wanted and wanted to do my bit to make this Kickstarter a success and suggest that if you find the project remotely interesting that you make a pledge yourself! After all we are all interested in better tools and speeding up development time. Something else that is extremely interesting with the LiveCode environment is the ability to write once and then compile to multiple operating systems, both mobile and desktop and totally cross platform. The campaign at the time of writing stands at 927 Backers having pledged £112,467 towards the £350,000 goal with 12 days to go. And even if you can't support the Kickstarter financially you can help create the buzz that it needs to happen to make this Kickstarter a success. 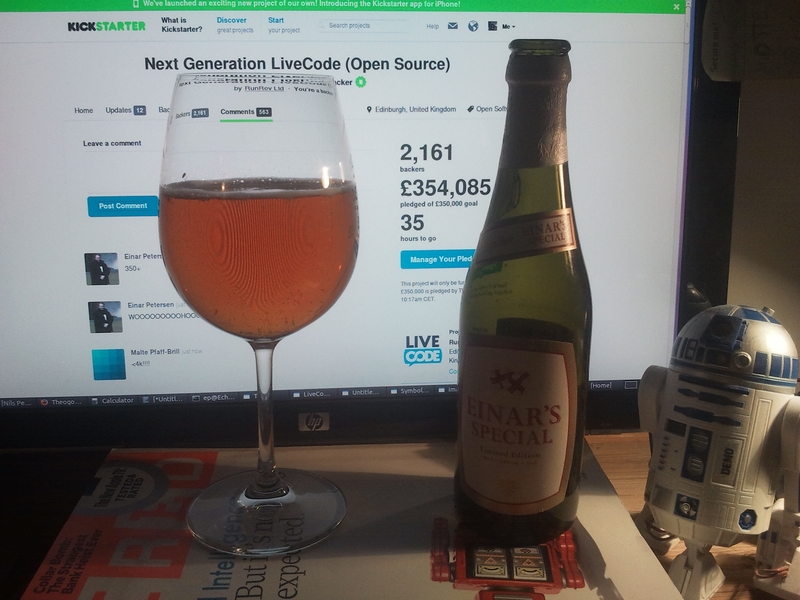 Whatever you do I hope you have fun and that you want to support the efforts to make LiveCode a GPL3 product. You can find my beginning dabblings with LiveCode here einarpetersen.com/doku.php?id=livecodeexperiment - The code is gross at the moment as I haven't really read the manual, but eventually I'll make a proper tutorial of my little project if I succeed. I'm making a simple app to train dexterity and test logical abilities for stroke victims, that will report back to doctors etc. so they can follow their patients progress, it'll be free and open source off course. Have tonnes of small projects like this if anyone would like to help regarding The Global Ability Initiative and free software for the disabled, just give me a ping. Why am I writing a post about LiveCode here - Well I have to admit I have a vested interest in seeing the Kickstarter succeed, after playing around I decided to become a backer of this project as well by making a pledge, not just because I feel it is an interesting development environment but also as I am an avid proponent of Open Source wanted and wanted to do my bit to make this Kickstarter a success and I suggest that if you find the project remotely interesting, that you also make a pledge yourself! After all we are all interested in better tools and speeding up development time and if we can do it with GPL tools all the better. I also think the the environment seems perfect for teaching non programmers to program as the syntax is very natural language like. But at the same time I think it is also quite suitable for both hobbyists as well as seasoned programmers. Take care - Keep up the good work! @Cyril Pruszko - had a brief look and commend you on the links and work you posted! Hey there, so what to do to get the message out… Well I've take to Facebook advertising :) As in real ADVERTISEMENTS. The advertisement has been approved - hope it helps, if any of you are in the position to do anything like this maybe you should try it. Let's see if we can't pull this one off, the projection says we're inches away - let us get some momentum rolling!!! Will not be posting further Kickstarter comments for now… unless something interesting comes up - https://sites.google.com/a/pgcps.org/livecode/ is the site dedicated to LiveCode mentioned in the comment above that you might want to check out! Her er noget som I evt. kunne tænkes at skrive lidt om. Åbenbart så er RunRev i gang med en Kickstarter, der går ud på at udgive softwaren som tidligere var closed source ud som GPL3, hvis deres Kickstarter er successfuld. Ville flytte billede 1 til 50,50 såfremt det rammer billede2 - Kunne være hvilken som helst anden funktionalitet. Det der især tiltaler mig ved LiveCode Kickstarteren er at de har et udviklingsværktøj som du kan lave cross platform kompilering til og som de vil gøre tilgængelig under GPL3. Jeg kunne godt tænke mig at høre …… læseres mening er der andre her som af principielle årsager kunne finde på at pledge til et sådant projekt eller er det helt hen i vejret at tænke således efter jeres mening ? I understand we're going to use OpenSource hard and software to build this thing. What say you are you with me ? I've been trying out LiveCode for an application to train dexterity and logical thinking for aphasia and stroke victims. With no prior knowledge, in less than 14 days, only dabbling from a couple of minutes to a couple of hours per day, even interrupted for several whole days, I have been able to create the basis needed for said application. The LiveCode Environment is a write once deploy to many OS/mobile platforms system, making it very interesting and I recommend you to try it.